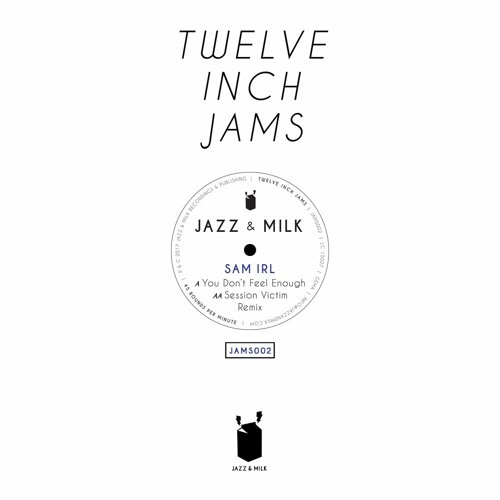 buy 12" vinyl / digital here: https://jazzandmilk.bandcamp.com/album/twelve-inch-jams-002 http://jazzandmilk.com/jams002-sam-irl-twelve-inch-jams-002 For their 12th label anniversary, Jazz & Milk have decided to launch a new series called Twelve Inch Jams in order to celebrate vinyl culture and the legendary 12 format! JAMS002 sounds the bell for the second round of the series including a 10 years re-issue of the classic Sam Irl cut You Don't Feel Enough. Originally released as a B1 tune on his African Dance EP debut on Pulver Records in 2007, this jazzy house gem found its way into the record bags of many influential DJs over the years. From Session Victim, Glenn Astro, Max Graef to Hodini... the record never disappeared in club sets but certainly from discogs a good while ago. So it was about time to give the tune a second life and finally press it on the format it deserves - a whole 12 side. The German production duo Session Victim are well-known fans of the track describing it as their secret weapon playing it in quite many DJ sets for years, including their 2015 appearance for Mixmag's DJ Lab. Hence, it is a great pleasure that Session Victim contributed a remix to the new release. Their absolutely elegant and groove-driven version with a charming 90's touch to it makes a brillant counterpart to the original with its jazzy piano-, drum- and double bass samples leading to an epic synth break that regularly causes ecstatic moments on the dancefloor.